regarding LGX, I actually like him since drama go go go lol. That’s where I first know him. I actually enjoyed god of war, Zhao Yun, even though there are many things wrong with it. And I know PA fans keeps chanting LGX’s chemistry with ZLY was better than with Yoona, but I enjoyed their relationship. There were two scenes in there I love: one where he held Yoona’s hand to do a fly kick while the two of them lock eyes on each other, it was not long but it’s like the old wuxia, where Yang Guo caught XLN mid air, slowly descent and lock eyes on each other. And another where he met the new Yoona and she fell into his arms and you can see how seeing her shake him to the core. And if it wasn’t for LGX, I would totally drop PA, I think starting from 26? Or 32, it was a chore to continue, and this is when I just had a baby and lot of time in my hands >_> (headphone or low/no sound as I read sub while rocking the baby to sleep or feeding him lol). Talking about the scene where Wuji rush this way from the palace to save Fuyao, I still miss his 10x speed move. This is a cool scene. He is really hot and handsome here. Wuji looks the best in black, imo. Too bad most of his wardrobe are light coloured. Damn! How can I missed it? I think this one we already added in fav scenes right? Or you meant no blood and all...I think they used all blood in Yao City, fuyao & the prince without balls fighting, and final fight scenes so when they shot this scene they left with nothing ! Just kidding !!!! I agree that some time Yang Mi wasn't impressive in crying scenes and I too felt that in TMOPB at one particular scene but let me tell you if you haven't seen LOF then you can't judge her based on her past performance. In LOF, Yang Mi gave her best and memorable performance. Also fuyao is not about how well she can cry but about portraying fighting skills and how strong she is mentally despite of all troubles! 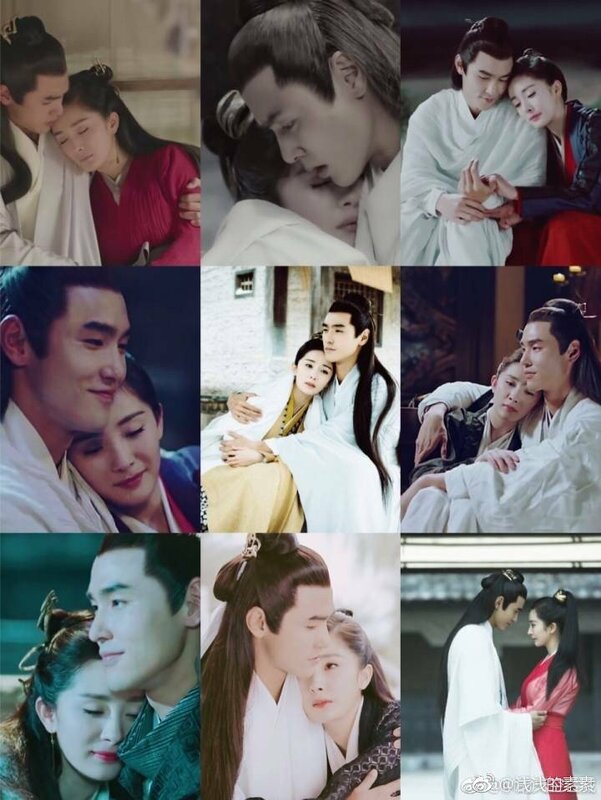 For me, Ethan And Yang Mi are irreplaceable as Wuji and fuyao. Wuji looks the best in black, imo. Too bad most of his wardrobe﻿﻿﻿﻿﻿﻿ are light coloured﻿﻿﻿. I think﻿﻿﻿﻿ this﻿﻿﻿ one we already added in fav scenes right﻿? I watched Legend of Fuyao and i am watching Ashes of Love. Both drama are great. Yeah....he is so handsome.....LOL..and can't be denied he has a good body shape too.. i just watched the legend of fuyao press conference at beijing 2017. It's so funny ... i'm very like that. Can see ethan, laiyi and gao han yu are so familiar. ethan and yangmi are so sweet and funny..they can joke together, laughed together and supported each other. I think their cooperation in filming is very good and very enjoy. The way they lean on each other shows so much about their love. I think you should start something different, after LOF I watched Guardian and I loved it. I think you should try that too, it's a modern drama and different from LOF, I loved the acting and chemistry between the leads even after wufu because it's not romance but "bromance"
Agree, I can see how much they love each other here. I can see they have really come along way, experience thick and thin together, always trust each other, always understand each other, always sacrifice for one another, always protect and care for each other. Their chemistry and acting are brilliant to the point that when they cry, I cry. They smile, I smile. When they are hurt, I am hurt too. Agree with what you said above, Yang Mi and Ethan is irreplaceable as Fuyao and Wuji. Exactly my thought. It is really rare to find people who have the same common interest like you and understand what you are thinking. I am glad to find you and other fans in this forum. Fuyao and this forum are ones of the best things that happen in my life.